You know how sometimes you pick up a book with the hope of achieving nothing but a lightness of mind, sort of like a distraction from all that is going on around you? That is the reason why I started reading Persepolis. It had been introduced to me by a friend and though I found it mildly interesting, I had put it on my ‘Must-read’ list. Well, if you must know, my ‘Must-read’ list comprises of widely acclaimed books like those of Marquez’s and Tolstoy’s that I’d really love to be in love with. Someday. For one, Persepolis is a graphic novel. You know, the ones with cute illustrations, characters speaking out in bubbles and rouge-on-the-cheek shown as a blob of pencil shade. Like Tintin. Or Calvin n Hobbes. Funny, but a bit juvenile, I thought. Boy, was I wrong! Persepolis 1 & 2 traces the story of Marjane Satrapi, an Iranian girl. With simple words and illustrations Marjane describes her memories of growing up in the war-struck country, moving to Vienna at 10, coming back after a few years, studying in Iran under the reign of Islamic Revolutionaries and finally moving out for good. Personally, I’ve been very interested in Iran, Iraq, Afghanistan and other Islamic nations (except for the UAE. Yawn!) I know not where this fascination comes from, but it has resulted in me trying to read Quran, understand the fanatics’ perspective and such in my late teens. Needless to say, my grandparents were deeply disturbed by this, even as my parents tried explaining to them that ‘it was just a phase’. My mother blamed it on Kamala Suraiyya and stopped prodding me to read Malayalam literature. Anyway, my point was, as much as I tried to understand what is going on there, there were always holes in my theories, you know. For instance, how the entire thing started was a mystery – yes, I knew it was about the oil and yes, the ‘Burger-and-Fries’ nation was involved, but the real deal – no idea. I tried reading about it in magazines and newspapers but after 2 pages of words like ‘imperialists’, ‘savak’, ‘proletariat’ etc, I gave up. It took too much effort to understand what was going on. What I find absolutely amazing about Persepolis is the ease with which the author explains what went wrong at Iran. It describes the effect of the countries mucked up political situations on the common man with simple words, instances and often, a tinge of humor. 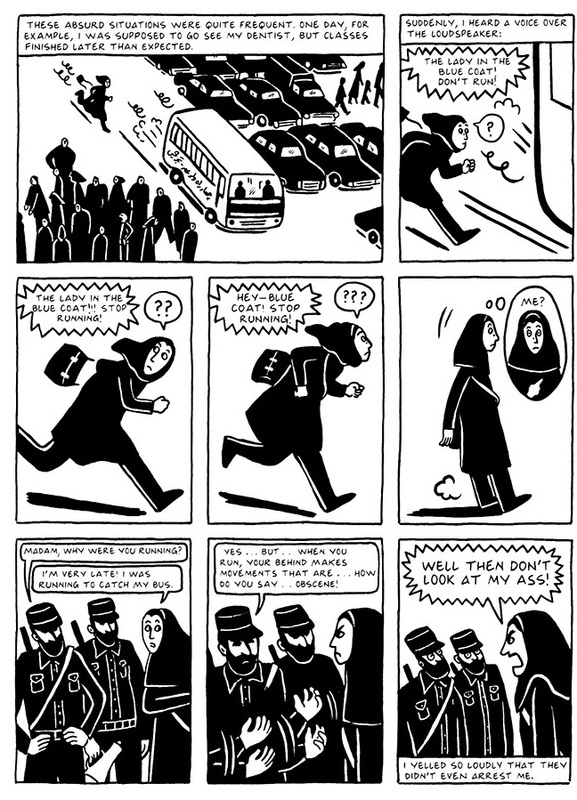 For example, Satrapi describes one of her brushes with the extremists and their obsession with women ‘maintaining their dignity’ in the following strip. I could go on and on about this, but nothing I say can do justice to Satrapi’s work. All I can say is this one is, officially, one of my favs. PS: If anyone is tempted to give Persepolis a shot, I have the ebook with me. Drop me a mail and I’ll let ya borrow it.